Almost everybody who has visited a land based casino stumbled upon a Video Poker machine. You can play Video Poker right at the bar, and at some casinos, even enjoy free drinks in return. But why exactly are Video Poker machines so popular? Is it the skill involved, or the simplicity of the game with touch-screen control? Maybe it's the high payout many of the Video Poker games offer, and of course the magical Royal flush, sometimes with a progressive jackpot. Even though Video Poker is very easy to learn and play, it is very difficult to master Video Poker strategies that help you to take full advantage of the often extremely high theoretical return to player (RTP), which can even be higher than 100 % in some cases. The paytable of Video Poker machines is based on poker hand rankings. So if you are familiar with Texas Hold’em Poker, you are good to go. However, it is not strictly necessary if you want to learn how to play Video Poker. The Video Poker machine will mark the completed poker hand combination after each game and pay you the winnings accordingly. If you want to WIN more consistently playing Video Poker, you need to become familiar with hand ranking. You will never hit Royal flush if you do not hold the required cards. You need to hold the 10, J and Q of hearts to be able to hit Royal flush. Sitting down at a random Video Poker machine might actually decrease your chances to win. Choosing the proper Video Poker game is one of the most important steps you need to take if you want to win more consistently playing Video Poker. Always remember to check the paytable and the payout of a given Video Poker game before playing. Contrary to slots, where you just have to trust the numbers published by casinos and casino software providers, the payout of Video Poker games can be statistically calculated based on the paytable. Check out our article about the most common and highest paying Video Poker games for paytables of their various versions found at land based or online casinos, along with the theoretical payout value. There are many Video Poker games available. Choose one wisely. Another important figure you have to take into account when choosing the right Video Poker game is the variance. The higher the variance, the longer it will take you to actually hit some paying combination from the paytable - though these less frequent wins on higher variance games are usually bigger. Video Poker games with lower variance pay more often, however bigger wins are less frequent. Variance is important when deciding what size of bankroll to choose in order to be able to reach your targets. For example, to play long enough to be able to hit at least one higher paying combination. This is much more complicated than it sounds, and our article on Video Poker strategy will give you all the tips and recommendations you need to get started. More important than it sounds, you can actually increase the expected payout based on how you structure your bet. First you have to insert some money into the Video Poker machine. This is done online either automatically, or you choose the amount and insert the money with a push of a button. At land based casinos, you just insert an accepted banknote. Based on the amount you inserted and the Video Poker credit value, the machine will show a number of credits. When you, for example, insert $20 and the limit is 5 cents, the Video Poker machine will show 400 credits. Some Video Poker machines, at land based casinos or online, give players the option to choose different limits. Most often, you can alternate among 5 cents, 25 cents (100 credits with $20), 50 cents (40 credits), $1 (20 credits) and $5 (you get only 4 credits with $20). Another huge mistake that very often hurts the chances of players to win is the choice of the number of credits to be played per game. ALWAYS USE THE "BET MAX" BUTTON to play maximum credits per game. The difference in terms of payout can be as high as several percentage points. If you want to bet 25 cents per game always choose a lower limit and play the maximum number of credits per game. 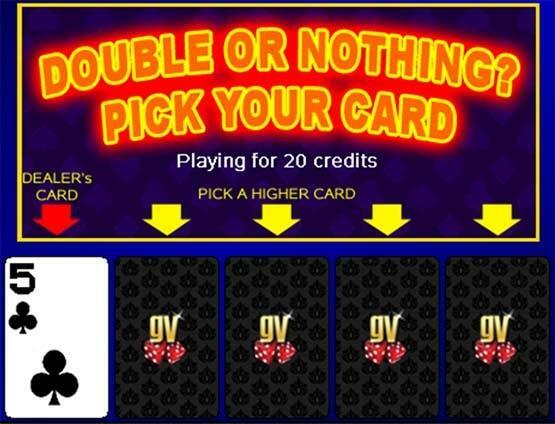 In this case, choose a 5 cent limit and bet the maximum of 5 credits. The expected payout value will be higher than when playing the same limit with one 25 cent credit. The exact theoretical payout difference depends on the game played. This is the most tricky part. If you do not choose proper cards according to optimal Video Poker strategy, the expected value of each hand rapidly decreases. If you do not want to lose you bankroll rapidly, make sure you hold cards based on the Video Poker strategy chart found in our strategy article and in Video Poker games articles. Without the knowledge of this Video Poker strategy chart, you will encounter situations where it’s extremely difficult to make correct decisions. Even though the theoretical return to player can be as high as 99.95%, it can become considerably lower when you start to make incorrect decisions. Make sure to print the Video Poker strategy chart and practise as much as possible playing free Video Poker online. Below is an example of the type of tricky situation where the chart comes in handy. Many players would definitely go for the Royal flush and hold the Jacks and Queen of diamonds (or the flush draw), which would in this case prove a major error. The correct play would actually be to hold the low pair (three of spades and the three of diamonds). And it gets even more complicated in games that feature a progressive jackpot. If the progressive jackpot reaches more than 21500 credits, the correct play would actually be to hold the jack and queen of diamonds and go for the Royal flush. However the expected return for flush draw would still remain lower than the Royal Flush draw and low pair. Many people would choose an incorrect way to play this hand without knowing the strategy. Go beyond the knowledge of the paytable to get as close to the theoretical payout as possible. Without knowledge of the paytable and poker hand rankings, a rookie player could hold just the queen of diamonds - and that would be disaster for their game. A similar disaster would be to make incorrect decisions, like the one in our example, consistently in the long run. Therefore make sure you master the strategy of whichever Video Poker game you play. 5. To gamble or not to gamble your winnings? A bet with zero casino advantage is great, isn’t it? However there are also some downsides to be aware of. Double or collect? A simple question with a not-so-simple answer. Most of the time, the gamble feature lets you gamble with your winnings, and usually double them when you are successful. You pick one card from 5, and if it’s higher than the card picked by the casino (machine), you double your winnings. There are usually limits on how many times you can double up. There are some games (including some by Playtech software) that let you quadruple your winnings by guessing the suit of the card. There really isn’t any casino advantage when trying to double your winning using the feature. At least there shouldn’t be. Unfortunately there were/are some dishonest software providers like SkillOnNet, where this wasn’t the case based on the experiences of players. You can read more information about this case on the blacklist at Wizard of Odds. A player in 303 double up games claimed he won 108 times and lost 193 times. The probability of that happening is 1 in 1 008 339! 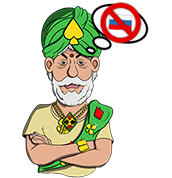 Fortunately, most proven casino software providers are honest, and the gamble feature really is a 50:50 bet with no advantage for the casino or the player. Another issue you should be aware of is that the double up feature can increase the payout ratio (for games with a theoretical payout lower than 100%), as for the same bankroll you will be able to play more rounds (when we consider double up option as separate game round). However, the double up option drastically increases variance, so you will need a much higher bankroll if you tend to double up your winnings often. If you double up multiple times after the initial double up is successful, you will need a huge bankroll. You can win big, but more often you will lose faster. But if your objective is to win as much money as possible in a short period of time, the gamble feature could be for you. Well now it looks like Video Poker is a really complicated game. It isn’t. That’s why it’s at all bar counters in Las Vegas - you can play it even when you are too drunk to stand up from the bar. 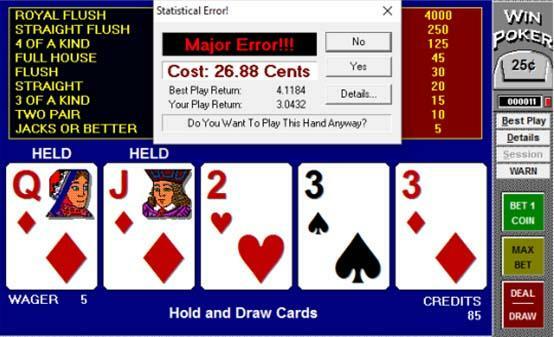 Just play Video Poker free online with no download or registration required to see how easy it is to play. If you want to be a successful Video Poker player, you have to go more under the surface, and master the Video Poker strategy. You can also take advantage of free bonuses as soon as you feel comfortable playing for real money. Not many online casinos allow Video Poker games when playing for bonus, but if they do, we’ll have them listed.